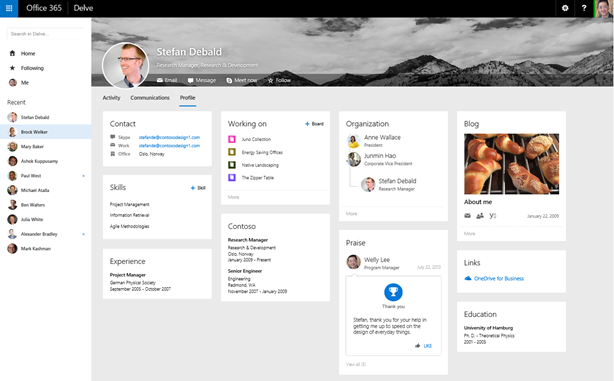 At the Ignite conference last week, Microsoft laid out a new vision for collaboration and portals that is a major departure from the site-based approach that has been the core of SharePoint for more than a decade. Microsoft still fully supports SharePoint in its current form and will continue to do so, both on premises and in Office 365, even as it introduces Office 365 Groups and a new suite of Office 365 "NextGen" portals that could replace SharePoint sites for enterprises that want a more modern, cloud based approach to collaboration. SharePoint sites will continue to work, but it's unlikely Microsoft will invest in enhancing them beyond where they are in SharePoint 2013. This article provides an overview of this emerging collaboration system, backed by links to the relevant talks at Ignite. The technologies described are still emerging subject to change; please view the videos directly for a more authoritative view. 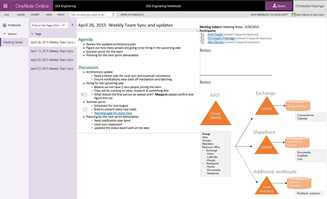 Office 365 Groups were introduced last September as a way to connect collaboration silos into a single experience for team collaboration. For an end user, a Group's shared assets are viewed in familiar applications like Outlook (the web version only for now), OneNote, and OneDrive for Business. 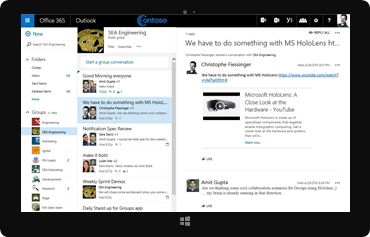 Groups will also appear in Outlook 2016 and in mobile apps. 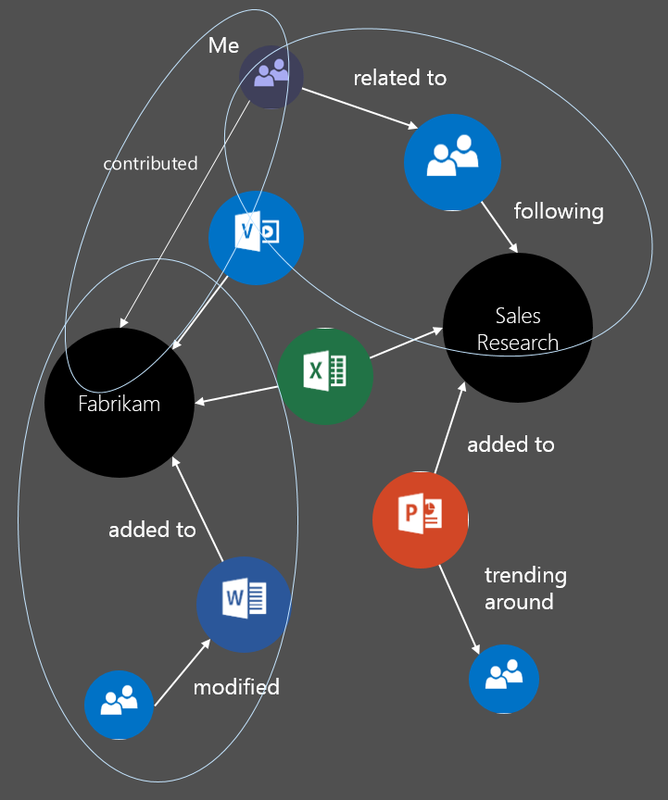 Groups will also appear in Delve, Office 365's most direct view of the Office Graph. 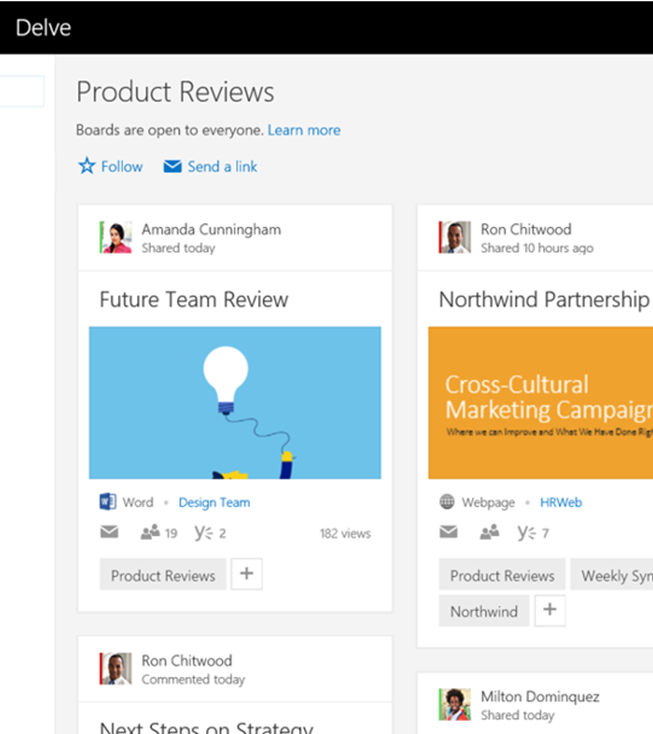 Groups are actually nodes in the Office Graph, and will have "cards" and profiles in Delve just as people do today. Dynamic membership based on Azure Active Directory attributes; for example a Group could be created for everyone reporting to Katie Jordan or all users who have the title "Sales Executive"
Microsoft says that Groups won't replace SharePoint Team Sites, and said that it might eventually be possible to include a team site as part of a Group. Already it's possible to create a team site in SharePoint Online and assign membership using the Azure AD Group to open it up to the same members. For developers, the Office 365 Unified endpoint will provide a REST API for accessing groups and their associated mailboxes, files, and other assets. Microsoft is producing a series of new, ready-to-go web experiences called the NextGen Portals. The first of these to ship was the Video Portal, which is now available in all Office 365 tenants. Microsoft noticed commonalities in the portals their customers have built with SharePoint, and they aim to provide simpler, out-of-the box NextGen portals to fill these needs. This includes Delve, which becomes more of a people portal with its new User Profile that helps people find expertise in an organization. It also includes a Knowledge Management portal (below). NextGen Portals are based on new, responsive page rendering engine; some also employ a new browser-based authoring canvas. Another thing they share is a connection to the Office Graph, which selects portal content and also can send signals back to the Graph (such as what video you watched yesterday). 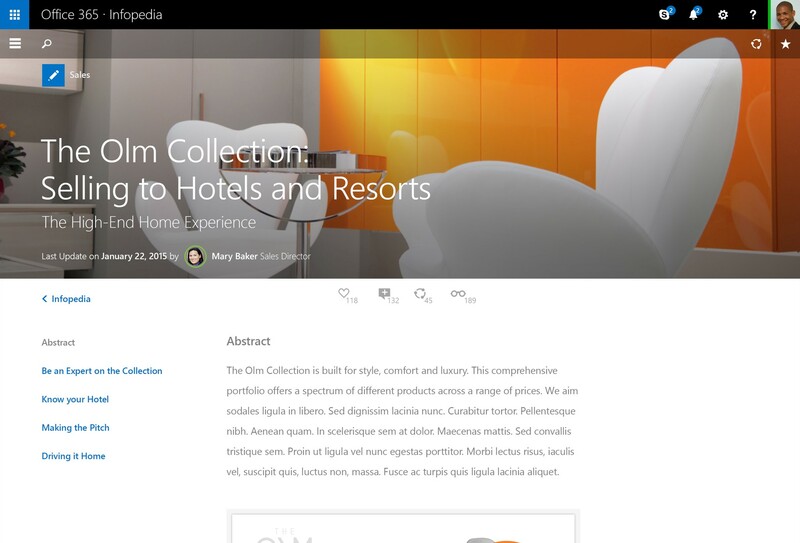 Portal content is stored in SharePoint site collections, but SharePoint "webs" as we know them aren't involved. Instead, libraries for Pages, Images, Videos (backed by Azure Media Services) and settings are stored directly in the site collection. 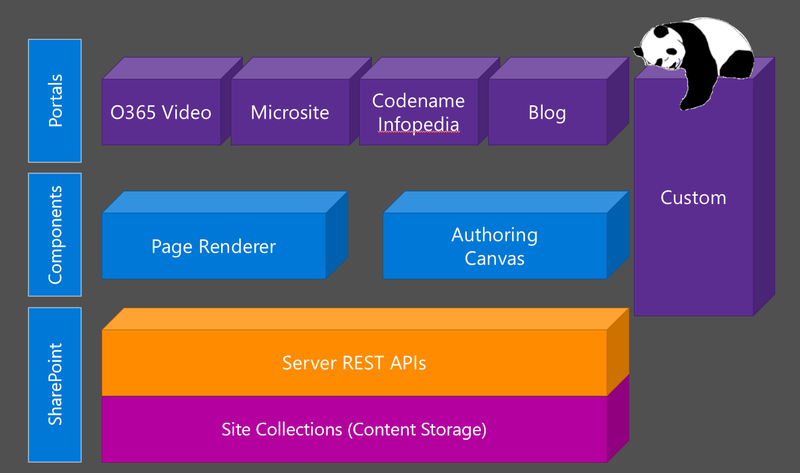 SharePoint's existing REST API is used to access the storage. In general, each portal has a "hub" site collection to store application wide or landing page content, and then additional content site collections. NextGen portals run as a single page app and users can add controls such as a table of contents, video or image control to them. No web parts here, but perhaps the beginning of something similar. There were mixed signals about custom NextGen portals; the presenters indicated they might open source the page rendering system to allow it to be used in custom NextGen portals or even on premises. 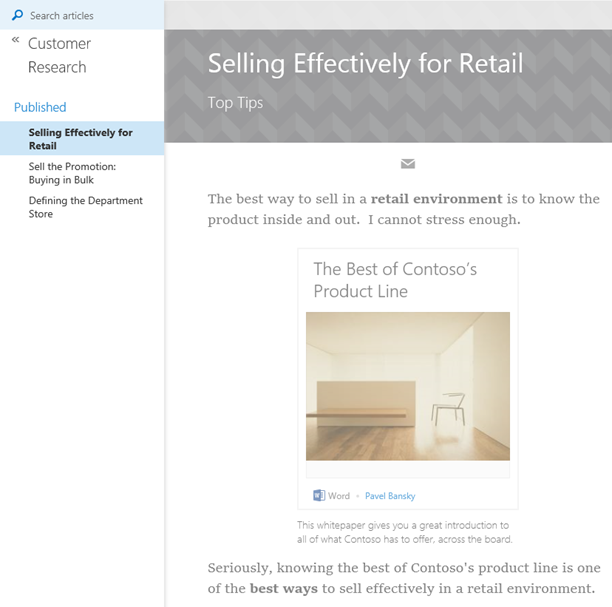 Office 365 Boards allow users to collect and share links to content across Office 365. Boards functionality is just starting to roll out to Office 365 tenancies now, where it can be found in Delve, where you can add one of Delve's information cards to a Board. Over time, you'll be able to add to a Board from "anywhere in Office 365." Even on-premises content will be integrated when the forthcoming Cloud Search Service Application (see below) is enabled. While Boards seem useful, anyone can just create any board they like; there's no provision for governance or organization. Microsites are simple publishing sites centered around one or more article pages and some links. The user experience is based on NextGen pages (see NextGen Portals, below). The file picker in the authoring canvas tries to predict what content you'll want to link to. You may be able to pick files from a Board, or add an entire Board to a Microsite. The code name for the new KM portal is "InfoPedia," and as it turns out, this isn't the first InfoPedia Microsoft has built. The first one was created by Microsoft IT for internal use, so Microsoft knows what we're up against when creating a KM portal. Badges and Microsites are for end users who want to collect and share information; the KM portal is for content stewards who want to curate knowledge for an organization. It's still a vision for now, and Microsoft showed mock-ups rather than a live demo. Content stewards can organize content (Microsites?) into sections; as with Badges and Microsites, content remains in place and "InfoPedia" points to it with a card system. A badging system is used to allow authoritative content to be marked; for example the HR department might have the ability to badge content that is official HR policy, and other departments and organizations might have badges as well. What's New for IT Pros? Microsoft let it be known that on-premises SharePoint is here to stay, and that they will continue to ship new versions for the foreseeable future. That said, there wasn't a whole lot new at Ignite for end users of SharePoint on premises. The Office Graph, a keystone of Microsoft's new investments, isn't available on premises (though it is possible to integrate on-prem assets with the cloud based Graph). Thus, new user experiences may be scant for these users. Microsoft did show an improved mobile experience for SharePoint 2016 users, but it seems to be about browsing lists and libraries and not a complete solution such as the NextGen portals offer. IT Pros are likely to be happy with the SharePoint 2016 offering however. The hardware requirements are similar to SharePoint 2013's, and upgrades can be accomplished via DB Attach or using a 3rd party migration tool. SharePoint 2016 will introduce a number of "MinRole" server roles to assist IT Pros in configuring a scalable and reliable farm. In SharePoint 2013 a server's role is defined by what services are enabled; in 2016,servers can be designated as caching servers, web servers, search, application, or "specialized". The SharePoint health analyzer is aware of these roles and will warn administrators if a service inappropriate to role is enabled; the exception here is that the "specialized" role can use any services (same as in SharePoint 2013). A big promise for SharePoint 2016 is a new patching system which will allow for smaller updates that require zero downtime to install. 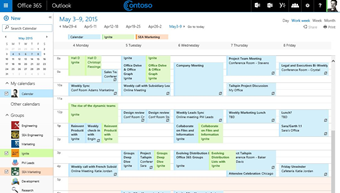 This technology was created for Office 365 and is being back-ported for SharePoint 2016. In addition, there will be a provision to create site collections more quickly by copying a master site collection in the database rather than activating "Features". (Presumably this is used in Office 365 to create the site collections that underlie NextGen portals, where there are no "Features" to activate). There were rumors before the conference of a "Hybrid Search Appliance," and during the conference there were rumors that Delve and the Office Graph would move on premises. Neither are true (and Office Graph is probably too complex to ever be packaged for use in customer data centers). However Microsoft did introduce a powerful new Cloud Search Application that will allow enterprises to create a seamless Search experience across Office 365 and their own data centers (with the index in Office 365); that includes the ability to include on-prem content in the cloud-based Delve. 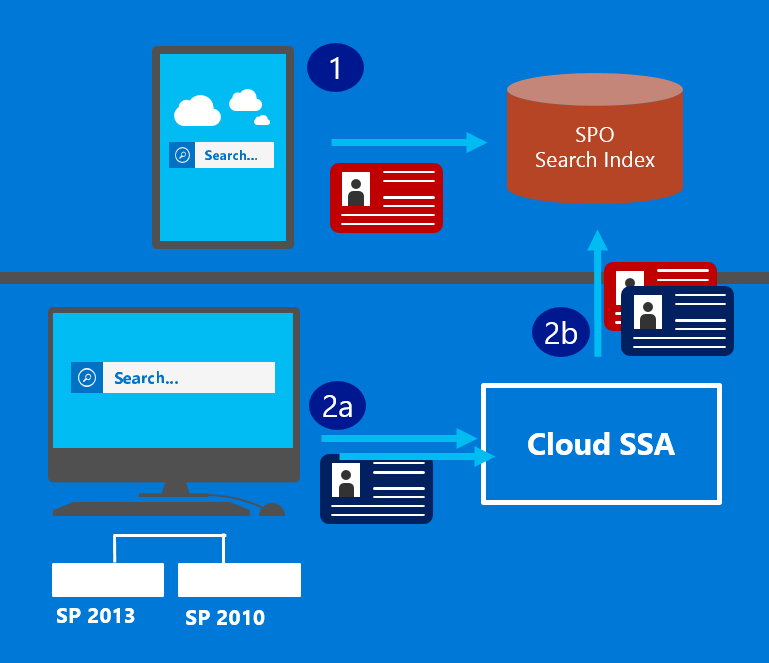 Later this year, an update for SharePoint 2013 will provide a new Cloud Search Application for SharePoint; this will also be part of SharePoint 2013. This service can be set up like any Search Service Application, and search connectors, IFilters, and content sources can be set up as usual. The difference is that the SSA can be configured with information about your Office 365 tenancy; as content is crawled, the text and metadata are encrypted, batched, and sent to the Office 365 search index. So file shares, legacy SharePoint content, or anything that you can crawl on premises all the sudden becomes available in Office 365 search and the Office Graph. Since there is a single index, all results are relevancy ranked in a single result set, rather than the side-by-side federated results currently provided. That's not the end of the story, however. Queries are also handled by the new Cloud Search Application; the presenters even showed a SharePoint 2010 farm that had attached to the CSA and was searching Office 365 via its query service. A single index and consistent search experience for on-prem and Office 365 content is a powerful offering, and one that will make it easier for customers to transition to the cloud. Microsoft CEO Satya Nadella said that "the most strategic developer surface area for us is Office 365". So developers will have plenty to work with as the new platform emerges. Microsoft recently introduced a new set of API's for access to content in Office 365. This allows developers to authenticate once to Office 365 in order to access a mix of services from Exchange, SharePoint, and other services. Currently the support list is relatively limited to calendars, messages, and files in OneDrive for Business (SharePoint). The goal, however, is to introduce a comprehensive set of API's that span the entire online service. The video portal, OneNote, and Yammer API's are already available in preview, and eventually Office Graph, Tasks, and Lync/Skype will appear as part of this suite of unified REST API's authorized via Azure AD. In addition, Microsoft is continuing to develop SDK's for iOS, Android, Java, Xamarin, Cordova and of course .NET.